Incredible useful and very simple to use. 2. Potential Alcohol. The key word is potential not realized. But it is necessary to know the starting potential alcohol. Then you can work some numbers. Hydrometer shows Specific Gravity from .990 to 1.170, Balling or Brix from 0 to +38% sugar by weight and Potential Alcohol by Volume from 0 to +22%. Hydrometers are calibrated to read accurately when the temperature is 60F. Slight adjustments are necessary to be accurate but our brewing is not rocket science . There are free online calculators if you wish precision. Place the hydrometer in the plastic tube. We personally use the same tube that the hydrometer is shipped in. Using the tube, you have to hold it steady with one hand as you pour in the liquid to be measured with the other hand. Then eye the level the hydrometer floats to. Option: we also offer a graduated plastic cylinder Hydrometer Jar that has a stand. The Hydrometer Jar is a nice convenience. Usually these are not sold together because often one only needs a replacement Hydrometer if their glass hydrometer happens to break. For some reason they do not make plastic hydrometers. To Have Value you must take a initial First Reading (SG) and then a Second or Final Reading (FG). Subtracting those values is how you determine Sugar, Potential Alcohol, and potential Acids. The Original Starting Gravity (OG) tells us How Much Sugar there is, How much Potential Alcohol there is, and if making vinegar How Much Potential Acetic Acid there is. 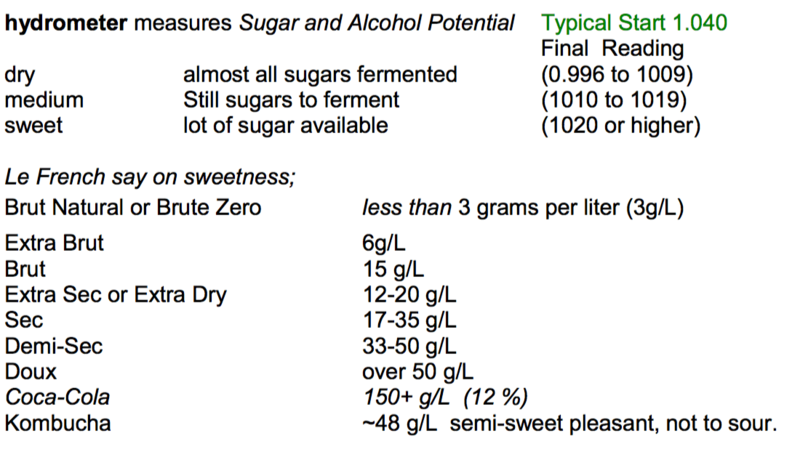 Subsequent readings or the Final Gravity (FG) tells us how much Sugar Remains and How much Alcohol or Acids there may be. At that point we may decide to continue the primary ferment, go on to a Second Ferment, or to stop. Our HYDROMETER is also available in our KOMBUCHA TEST KIT 1. Offering simple inexpensive Home Testing of Ferments. For additional information on using the Hydrometer to determine Alcohol, Sugar, Acids and Total Acid (TA) How to Test KOMBUCHA TEA for alcohol, Additionally the Hydrometer may test Specific Urine Gravity. Low specific urine gravity is associated with conditions like diabetes insipidus, excessive water intake, diuretic use or chronic renal failure. see our Library and Research Section for Test for Alcohol, Sugar and Acids.